The album was commissioned by the British music magazine Q. "Jack White does ‘Love Is Blindness,' Depeche Mode do ‘So Cruel,' Patti Smith did ‘Until the End of the World,' Damian Rice does ‘One.’ It just goes on,” said Bono at the Toronto International Film Festival last week. 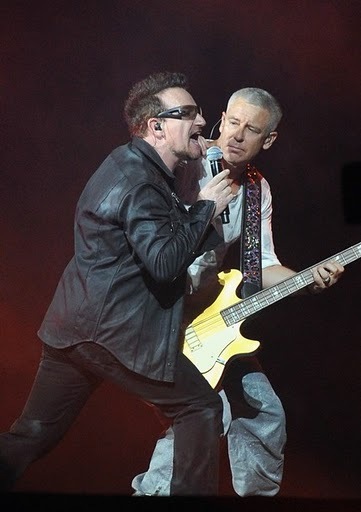 “And it’s strange, because when I hear the album, when U2 do it, all I hear is what’s wrong with it. But when I heard all these artists doing it, I thought, ‘It’s really good.'" In addition, Bono said that artist Damien Hirst recently completed a video for "Even Better Than the Real Thing." "He made a very special art work, which has only been shown once and probably won’t be shown again, because [it was for the] Glastonbury festival and it’s an extraordinary work of art." Without hesitation, Bono answered, "'Even Better Than The Real Thing.' Now there’s a mix of it, which is stunning, called the ‘Fish Out of Water’ remix, which I would like to release as a single," he said. "I’m trying to talk some people into it, even today. It has the Damien Hirst thing. Damien did his work to that mix. That’s the one we open with and end the film with."